The Kong Anxiety Reducing Shirt provides a snug fitting and lavender scent to help soothe distressed dogs. Ideal for jittery pups, the snug-fitting shirt helps to make a dog feel at ease during long car journeys, thunderstorms or when suffering from separation anxiety. Measure the length or your pet's back from the base of the neck to the base of the tail. If the measurement is between sizes or if your pet has a stouter build, select a garment one size larger for a proper fit. Below are some recent questions we've received regarding Kong Anxiety Reducing Shirt for Dogs, including answers from our team. What is the material ?is it waterproof?what is the size of small to medium? The material of this is 90% polyester and 10% spandex, so should be water resistant but isn't totally waterproof unfortunately. The Small/Medium is measured 14" in length along the back, 12" around the neck, and 15" around the chest. Unfortunately our suppliers are unable to advise. 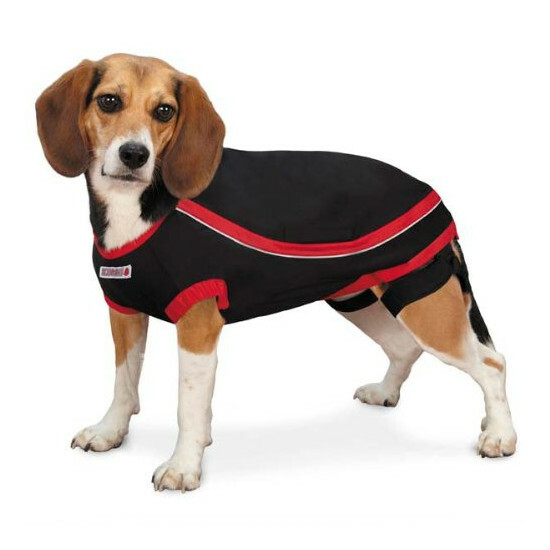 I can recommend the Thundershirt range that comes in various different sizes including X-Large. What are measurements of extra large? The extra large is 61cm from the base of the neck to the head of the tail and is suitable for breeds such as Golden Retrievers and Labradors.